Welcome to Harvest Monday. 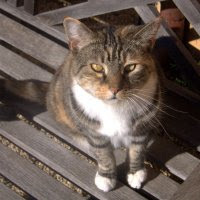 I'm stepping in for Dave of Our Happy Acres as the temporary host of Harvest Monday for the month of January while he takes a much deserved break from the task of hosting every week. Harvest Monday is where we celebrate all things harvest related. 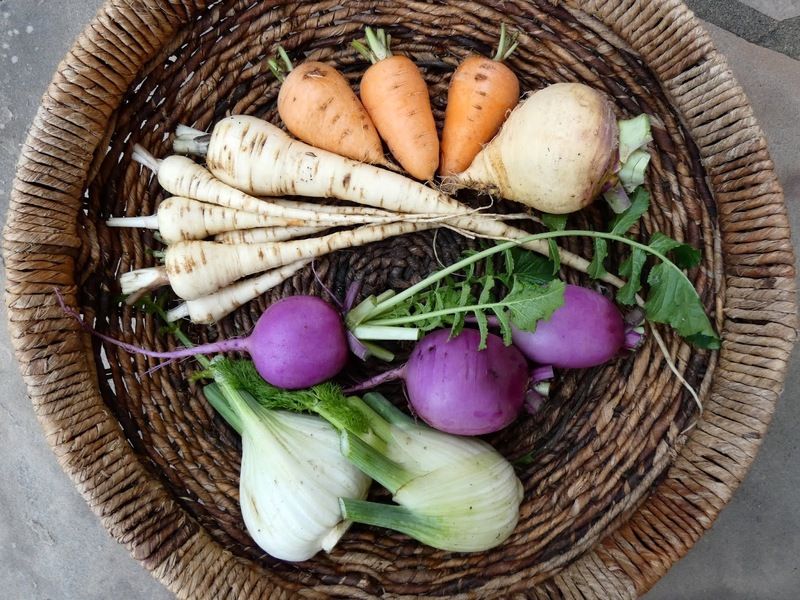 This is the place to share your latest harvests and what you've been doing with them. If you would like to link up you will find Mr. Linky at the end of this post. Next week Dave will be returning as our host for Harvest Monday so be sure to go to his blog Our Happy Acres if you want to link up. There isn't anything new that came out of the garden last week. It's definitely a wintry looking bunch of harvests. The Bora King daikon radishes are mild and beautiful and have been great in salads. 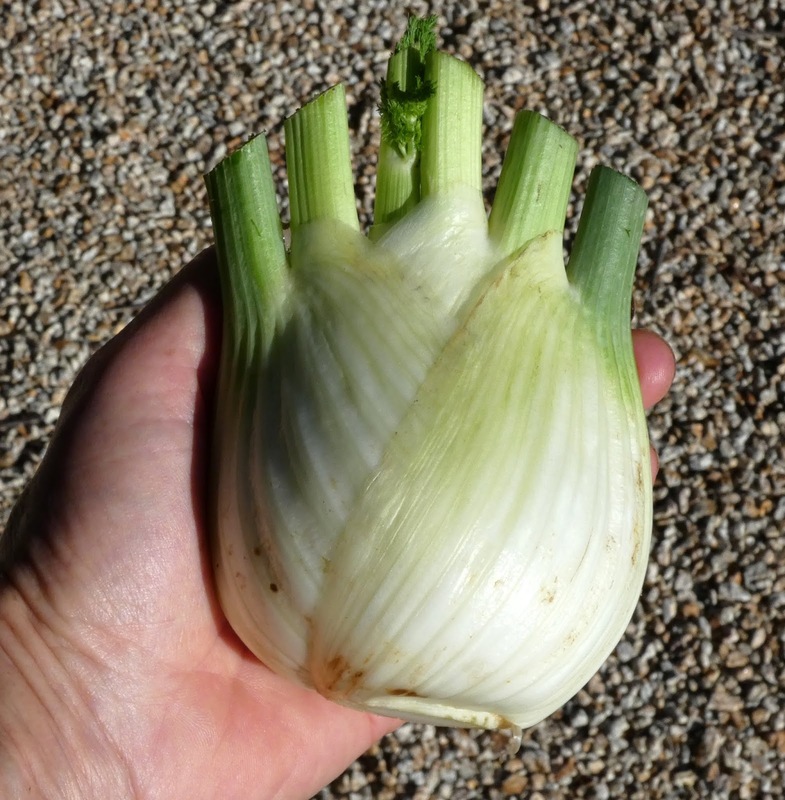 I used that soft ball sized celeriac in a gratin which I made almost following a recipe from a book that I have a hard time believing has been in my collection for nearly 20 years - The Cook and The Gardener. It's a simple dish, slices of celery root poached in stock and then layered in a baking dish with cheese and then baked with a mixture of creme fraiche and stock. I used a truffle pecorino instead of parmesan and poultry stock instead of beef stock, but other than that I followed the recipe. It was our "main course" one night accompanied by a salad. Dave declared it a winner. 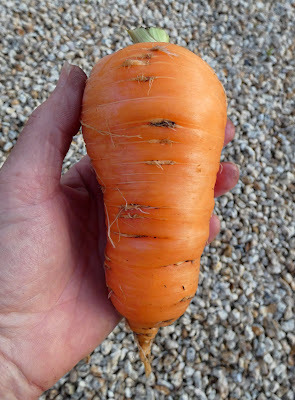 I continue to harvest carrots as I need them, mostly to add to salads. We, especially I, eat a lot of salads, it's what I have for lunch most days during the week. 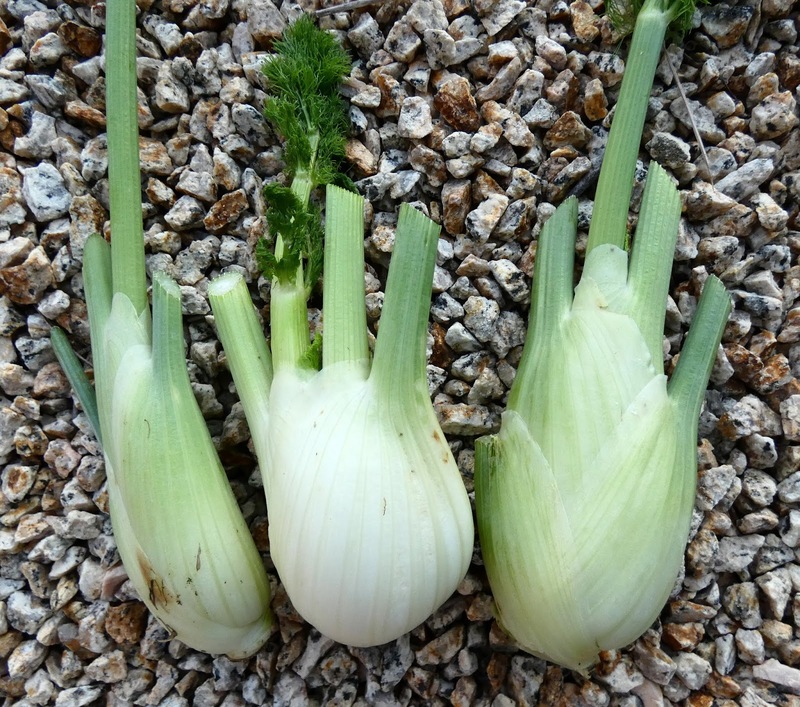 The celery stalks have become rather short of late but they are still crisp and succulent. I think that the cold short days in the depth of winter slowed the plants down. 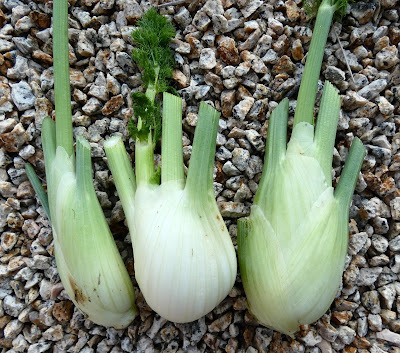 I am still amazed at how productive Orion fennel is. I've never grown a bulbing fennel that has been as productive as Orion. This is one more bulb that sprouted from the root of a plant that I sowed back in the spring of 2017. Wow! And there's more to come. Queen of Crunch lettuce is still hanging in there. I cut one more head that was starting to bolt but the lettuce was still crunchy (very!) and not at all bitter. And I cut down more Rishad cress some of which was just starting to bolt also. It is mildly peppery but not bitter. I love it in my salads. That's the latest from my winter garden. If you have a harvest you want to show off then enter a link to your post below and please leave a comment too. And be sure to visit the other bloggers who link up here. Welcome to Harvest Monday. 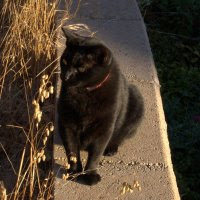 I'm stepping in for Dave of Our Happy Acres as the temporary host of Harvest Monday for the month of January while he takes a much deserved break from the task of hosting every week. Harvest Monday is where we celebrate all things harvest related. 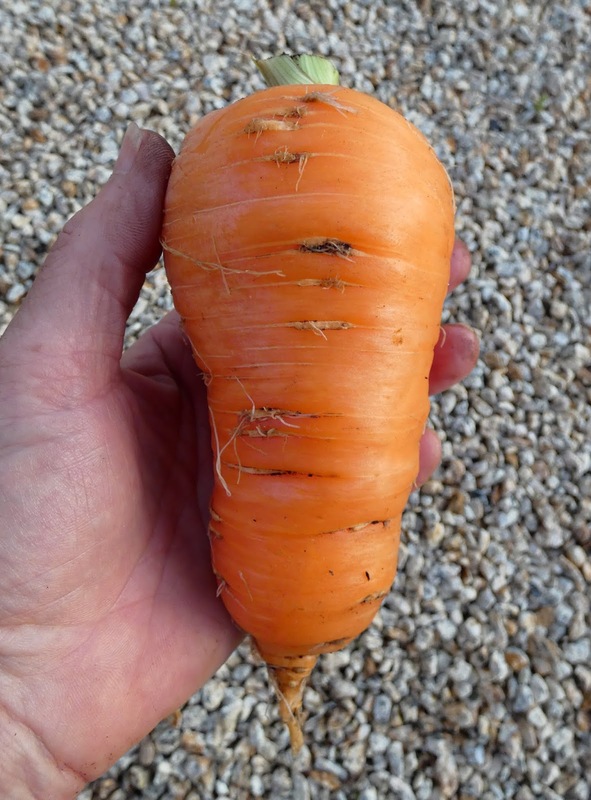 This is the place to share your latest harvests and what you've been doing with them. 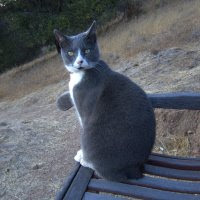 If you would like to link up you will find Mr. Linky at the end of this post. Sorry I'm late with my post today, I had a minor problem come up that kept me from finishing last night. So the harvests have been wintery looking again. One night I was in the mood to make some soup so I raided the garden for some soup materials and then some. I used the carrots, rutabaga, and fennel in the soup and saved the parsnips and radishes for another day. I use the radishes in salads and the parsnips are still in the fridge where they keep well for a long time. 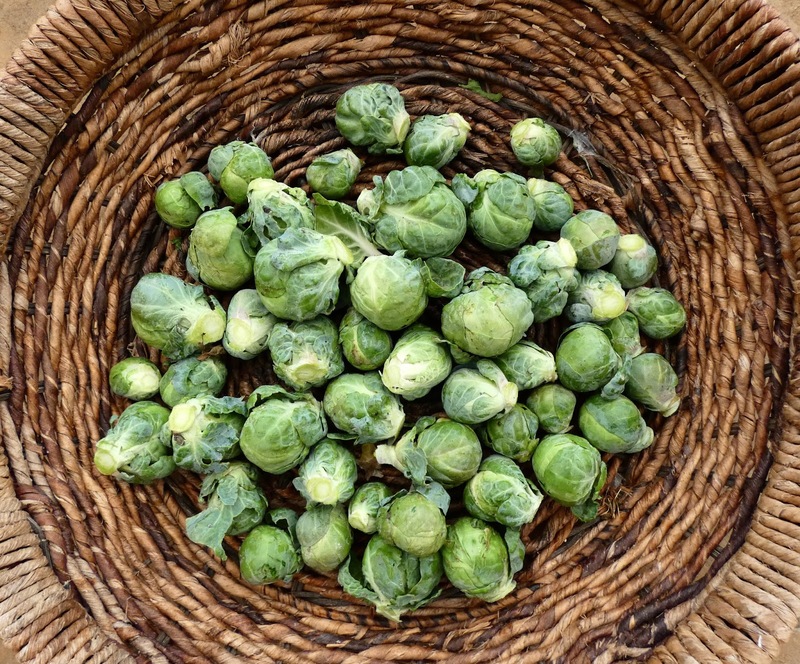 My first harvest of Brussels sprouts is not one of my most impressive, most of the sprouts are quite small but after trimming I still netted about a pound. These were fine in a warm shredded salad and you would have never guessed that most of them were runts. Pink Plume celery is still producing impressive harvests and the stalks are extra crisp and juicy because of the cool and wet weather. I finally pulled up the red beets that I sowed way back in July which just never seemed to be happy. Those were the best of the bunch and the rest were so small that I couldn't be bothered to deal with them so they went into the compost. The kalettes are much happier and I got enough to make another couple of servings. Next year, actually this year, I'm going to double up on the number of plants because even though that looks like a fair amount it only weighed 6 ounces. This fennel harvest came from a fennel plant that I sowed back in April of 2017 which came back in 2018 and I allowed to bloom through all of last year and after cutting it back at the end of 2018 it started producing new shoots again and some of them are turning into nice little bulbs. 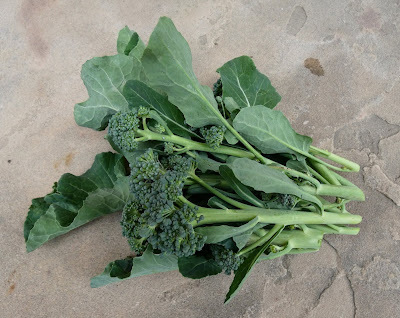 I still haven't cleared out the old rodent ravaged broccoli plants and they managed to give me a handful of shoots. And the volunteer cress is still growing happily in the winter weather. Surprise! There's still a few lingering peppers in the garden. That's the latest from my winter garden. I'll keep this post simple since I'm so late getting it done. If you have a harvest you want to show off then enter a link to your post below and please leave a comment too. And be sure to visit the other bloggers who link up here. 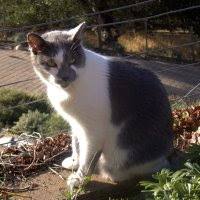 One of my readers is a local gardener who is a member of the Carmel Valley Garden Club. He approached me with the suggestion that I make a presentation to the club about my garden. I was hesitant at first because I have very little experience talking in front of groups. But I thought it would be a good challenge for me so I gave him the ok to put my name forward to the group as a possible speaker. 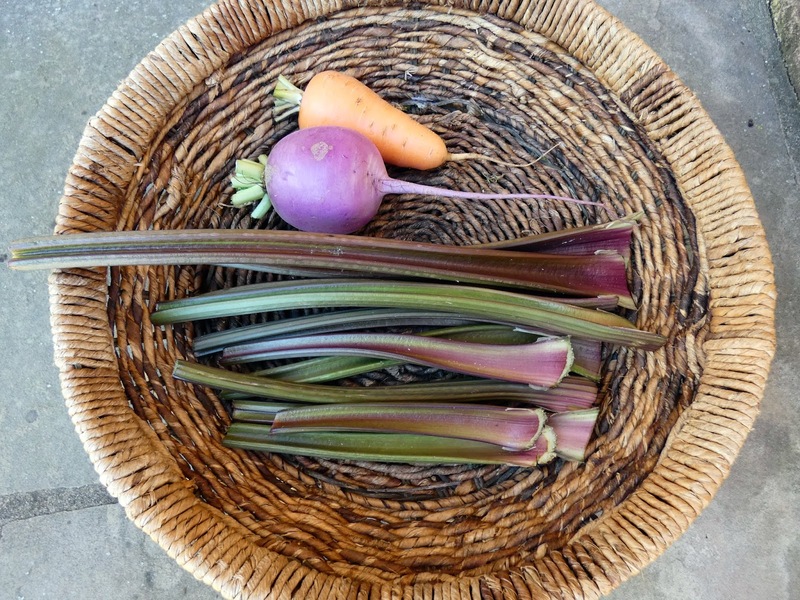 Well, after a bit of vetting I was extended an invitation to talk about growing vegetables year round in Carmel Valley. I even got to choose which month and I chose January so that anyone who was inspired to tackle a year round garden would have the opportunity to do some planning for the year ahead. Last night was the big (to me) event. I think I did ok. Everyone was generous with applause at the end of the talk and I received a lot of great questions. In preparation for the talk I culled through the past few years of photographs to illustrate what the garden looks like through the year as I cycle my beds through the 4 year rotation that I've devised to maximize what I can grow. It was much more difficult than I had anticipated to pack a year of growing vegetables into a 45 minute talk. But I managed to whittle things down and make a coherent (I hope) narrative and it occured to me that that narrative would make a good series of blog posts. Putting the talk together was a good exercise for me because it helped to bring the process of going through those rotations into sharper focus. Putting it on my blog is a great way to document the process. First some general things I've learned over the years. Let's start with the first year in the rotation. I'll be looking at a hypothetical single bed as it goes from one year to the next. I hope it's not confusing that I use pictures from from more than one year to illustrate what I try to grow through the course of one year in one bed. 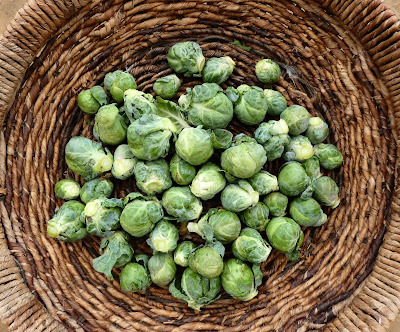 Not every year is the same because vegetables fall on and off the grow list from year to year. What I want to illustrate is where I would be growing something if I happened to be growing it. In January I sow the entire bed or nearly so with a cover crop. I usually make my own mix based on Kodiak mustard along with some annual grasses, peas, and favas. 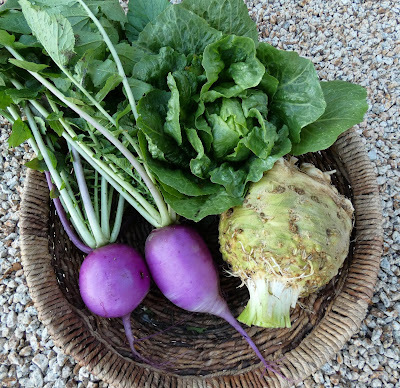 Sometimes I use a mix from Renee's Garden Seeds that contains Winter Rye, Hairy Vetch, Daikon Radish, Rapeseed, Purple Top Turnip and Austrian Winter Peas. Either mix works well. The birds like to munch the emerging seedlings so I cover the entire bed with Agribon row cover fabric. The birds would continue to graze on the cover crop if I didn't keep it covered as long as possible. At some point the cover crop can no longer be restrained by the fabric so it gets set free. At this point the birds can't do much damage. When I mix peas into the cover crop I like to find the tender tops of the pea plants and harvest them as a green vegetable. 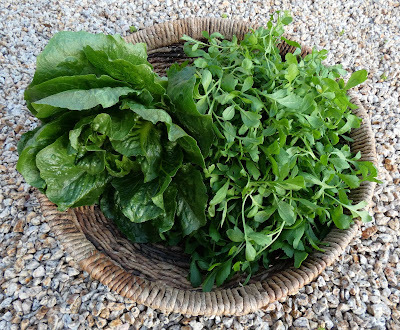 The key to harvesting a tender pea shoot is to cut it so that it doesn't have a tendril that hasn't started to curl up because the main stem in the area of a curled tendril will already be tough. A little curve is ok, but avoid the tendrils that want to cling to something already. I cut down the cover crop in April using hedge shears. If things were not in a raised bed I would probably opt for a string trimmer. There's 2 options at this point, either cover up things up right away and let the greens rot before digging them in or dig them in right away and let them rot in the soil. I usually opt to dig them in right away to just get the process over with. And then I mulch the entire bed with cardboard. The worms and other critters in the soil get to work and the greens disappear in a matter of weeks. Another advantage to digging the greens in right away is that they decompose more quickly in the soil than on top of it, even when they're covered with cardboard. I aim to plant my tomatoes and peppers sometime near June 1. First I dig in various amendments to the soil including a year's worth of egg shells that I pulverize in my Vitamix blender. Other amendments include compost, organic soybean meal, feather meal, fishmeal, rock phosphate, kelp meal, and azomite or glacial rock dust. I never use a tiller, I just turn the soil over once, break up the clods and then rake the top smooth. Then I set up a trellis along the north side of the bed to support the tomatoes. The trellis is made of T-posts and concrete reinforcing mesh which I attach to the posts using cable zip ties. Each plant gets a sprinkle of Mykos mycorrhizal inoculant in the planting hole and then a drench of Azos beneficial bacterial inoculant. The pepper plants in particular respond well to the inoculants. Before I started using the inoculants I had problems with peppers becoming sunburned because of poor leaf coverage. The inoculated plants grow more vigorously and have larger leaves and I rarely have problems with sunburned peppers anymore. Tomato and pepper plants grow very quickly at this time of year. I tie the tomato vines to the trellis using strips cut from old cotton t-shirts. I prune a lot of the suckers and remove a lot of leaves to improve air circulation and allow more light into the interior of the plants. I also like to do a prophylactic spray of an organic fungicide once or twice in the first month after the plants take off. Foliar diseases always seem to crop up some time during the growing season and I've found that spraying before the diseases show up reduces the incidence and severity of infections. Occasionally I'll treat them later in the season if foliar diseases start to appear. The first small fruited tomatoes start to ripen in August but the bulk of my tomato harvests are in September and October. You can see in the photo below how I've removed leaves and suckers from the bottom of the plant. 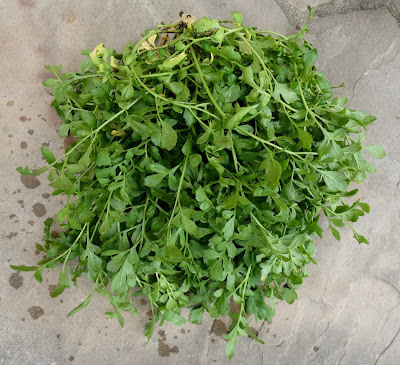 I continue to remove leaves and suckers through most of the growing season and especially target any growth that looks like it is succumbing to a disease. By the end of the season I just let the plants go and don't worry so much about dead and dying foliage. 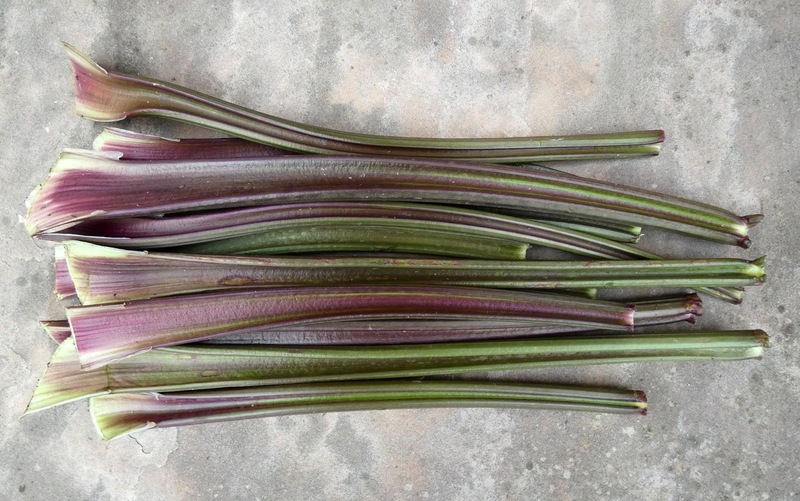 The pepper plants don't need so much trimming and training, although some might need staking. The cages around the pepper plants in the photo below were covered with fabric early in the season when the plants were in bloom to isolate the plants for seed saving. December - Early favas and mustard. I may start removing plants as early as November in some years and other years I may not get around to it until the end of the year. I can sow a cover crop as soon as a space is cleared or I can plant some fava beans or I may just cover up the space with a cardboard mulch until I can get around to planting something. Some peppers are tolerant of cold weather and may have peppers ripening as late as December, January or February. I group those peppers in one corner of the bed and provide some frost protection and usually let them grow on through the next year. And now for a few of my favorite tomatoes and peppers. Piccolo Dattero is an Italian hybrid cherry tomato. They are one of the tastiest cherry tomatoes that I've ever grown with a nice balance of sweet and tart. They hold well on the vine and rarely ever split. The plants are vigorous but not too much so and they are very disease resistant. Sweet Gold is another hybrid with pretty good disease resistance. The flavor is great and fruits resist cracking. Jaune Flamme is a French heirloom that produces small tomatoes with a big flavor. The color is gorgeous too, the inside of the tomato is usually blushed with pink. It produces over a long season, usually one of the first to ripen and one of the last as well. Marzano Fire is a new open pollinated paste tomato bred by Fred Hempel at Baia Nicchia Farm in Sunol, California. It looks like a typical Marzano tomato but it has gold stripes. It makes great sauce, puree, and paste but it is also very good eaten fresh. Chianti Rose is a cross between Brandywine and an Italian heirloom. It's a nice large pink beefsteak type with a rich flavor. It has far more flavor than any Brandywine tomato that I've ever grown. Brandywine tomatoes resent the cooler climate in my garden and never develop a good flavor but Chianti Rose just shrugs off the cool weather. Pantano is an Italian red beefsteak that I tried on a whim one year and I found it to be a winner. It produces very large fruits with excellent flavor and even though it's originally from Rome it seems to do just fine in the cooler climate here. Mavritanskite is a Latvian heirloom with dark brownish flesh, oftentimes with greenish shoulders (which some tomato connoisseurs to be a sign of superior flavor) and full flavor. It is a little more disease prone but the great flavor makes up for that. I love fire roasted sweet peppers and I've grown a lot of peppers in search of the best and Ajvarski is the best yet. This heirloom from eastern Macedonia has fruits that are large and thick fleshed. The shape being straight and smooth without deep indentations or curves makes them easy to roast and peel. But most important the flavor is fabulous. Florina is my next favorite roasting pepper, second to Ajvarski only because it's shape makes it a little more difficult to roast evenly and its flesh is less thick. It does seem to have one advantage to Ajvarski though, it seems to be more resistant to powdery mildew. This is an heirloom from Greece and I'm very fortunate to have acquired the seeds in a trade with another gardener because the seeds are not available in the US. I've been searching for a good yellow fleshed pepper for a long time. Most of the ones I've grown have had mediocre flavor or other failings. Topepo Giallo is one of the best so far. It's mostly squat squash shape and thick flesh makes it great for stuffing and roasting but it is also good eaten fresh. It also dehydrates well. It seems that I'll have to save some seeds next time I grow them because my source no longer offers them. Odessa Market is my favorite pepper for eating fresh. It has medium thick flesh with a thin skin and is incredibly sweet and flavorful. The plants are compact and productive. The immature peppers are lime green which really stands out and they are one of the few green peppers that I find to be tasty. I've noticed that seeds are not reliably available from year to year and this seems to be an off year so they may be hard to find. I grow a number of chile peppers, not all of them hot, but my favorites are mostly Capsicum baccatums, which are native to the Andes where they are called Aji which means "pepper". Here you will usually see them redundantly called "Aji peppers". Their notable attribute is their aromatic fruitiness. I like to ferment them and turn them into hot sauces and pepper flakes. The plants are cold tolerant and will usually overwinter easily in my garden with minimal protection. Many of them are also late to ripen. I also experiment with Capsicum chinense peppers on occasion. That branch of the pepper family includes the blazing hot Habanero peppers and other notable scorchers but I prefer their milder cousins. Unfortunately a lot of the chinense peppers are late to ripen and are not tolerant of cold weather so I usually don't get much of a harvest. 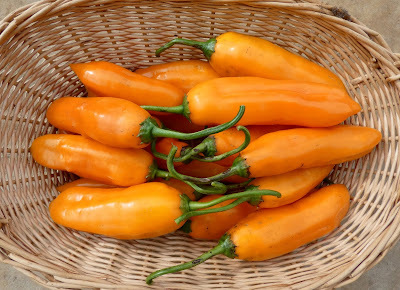 One chinense pepper that I've had fairly good success with is Habanada, a completely mild habanero that has the aroma and fruitiness of it's spicy cousins that is usually undetectable to those of us who are pepper wimps. Another pepper that has become a favorite is a pepper from Ethiopia that goes by a few different names including Ethiopian Brown, Mareko Fana, and Berbere. It has become a favorite of mine for making chile pepper flakes. Thus ends the first year in the 4 year rotation through the beds in my garden. My next post in this series will cover year 2.